In this lesson we examine how you can apply the five shapes from lesson Get Connected. Pentatonic Scale Positions in a slightly different context… The backing track accompanying lesson pentatonic excursion was considerate enough to stay in the key of A minor throughout so, whichever pentatonic position you were using, all you had to do to round off a phrase effectively was to find the nearest root note (in that example, A). An identical approach would get you through certain simple chord progressions, for instance, the classic minor blues progression (using the chords Am, Dm and Em) can actually be tackled using Am pentatonic throughout. You can see from these formulae that Bb and F are ‘common tones’, which is jazzer parlance for “notes present in both scales”. However, a note like D, which sounds great over Gm, would clearly be horrible over Bbm, and would have to be moved up or down one semitone to complement this second chord. In short, then, some thinking is required! The obvious way to handle the chord change would be to stick with the same box shape and move it up and down in three-fret increments whenever the chord demands it. However, I think you can hear the joins when a player improvises like this (G minor lick, pause, Bb minor lick, pause… and so on) and perhaps a more fluid sound is obtained by keeping your hand in the same part of the fretboard as the chords change, moving between different pentatonic shapes to compensate. Exercise 1 should clarify this. 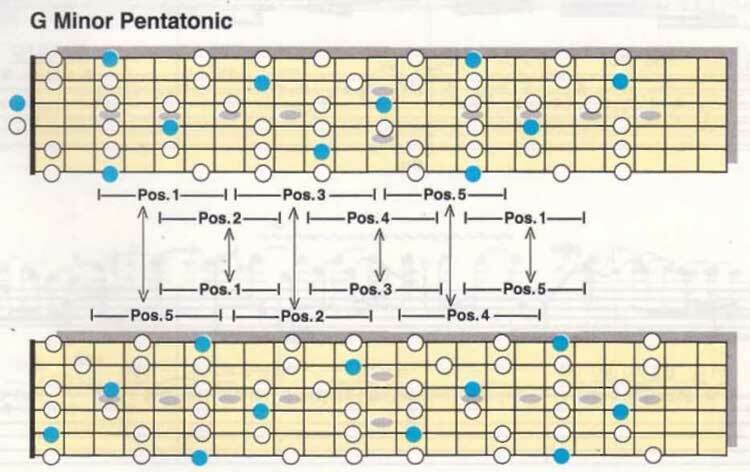 From the diagrams, you should be able to see that you could play position 1 of Gm pentatonic and position 5 of Bbm pentatonic without moving your hand from its moorings. Try playing over the backing track using only these two shapes, aiming to visualise where the Bbm-friendly notes are before the chord comes along. When that feels comfortable, you can move your hand up a little and become familiarised with the transition from position 2 of Gm, and position 1 of Bbm. Proceeding systematically up the neck, you should then get to grips with how positions 3, 4 and 5 of Gm pentatonic flow smoothly into positions 2,3 and 4 of Bbm. I find that this approach helps you to play through the changes, rather than isolating each chord individually and constructing licks around it. On the audio demo, I also threw in some chromatic passing notes and attempted to anticipate some of the changes by playing over the next chord a beat or two before it actually occurs for that fusion feel. 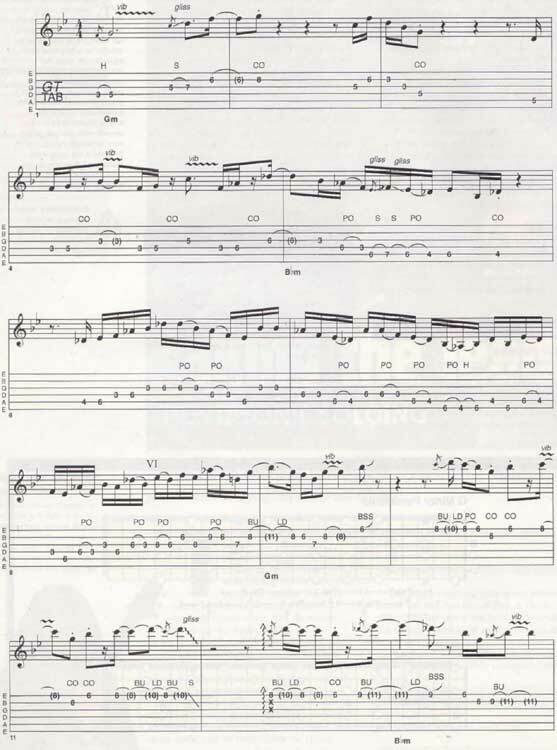 See if you can spot where it happens in Exercise 2, which is a transcription of the solo in the audio. Enjoy! It’s a part of Taking The Lead. Pentatonic Solo guitar lesson. © 2012 - 2019 TabsClub Powered by TabsClub 42 queries in 0.288 seconds.